"Our philosophy is to sell the way the customer wants to buy." Think about the best and worst buying experiences you've ever had. What did the salesperson do to make it a good experience? What did the salesperson do to make it a bad one? Isn't it easier to remember the worst experience? When we have bad buying experiences, what do we do? We often make an emotional vow never to do business with that individual or company again. What contributes to the best experiences? You might know what it takes to be the best, but do you have the motivation to do it? Do you appreciate the benefits? Do you have the time to do it? Do you know how? There is a huge void between knowing something and doing it, between doing something and doing it well. Sales leaders strive to be the best. They don't settle for less. They don't want their customers to settle for less than the best, either. Sales leaders take the initiative to continually improve. Leadership starts with initiative. It relies on being willing to make changes and to take risks in new areas. Sales leaders take no comfort in the status quo. They know the comfort it brings is fleeting. How do you plan on doing it? They also execute their plans extremely well, attending carefully to details and taking into account the uncertainties of future projections and the quirky contingencies that can arise. We'll call the model described here market-based selling (figure 2). The model is designed specifically for the sales professional. It is based on the belief that before you sell, you must be clear about whom you are selling to and why. Companies must successfully market their products and services in order to survive. As a sales professional, you must market yourself successfully to stand out from the crowd. Prospecting is about developing the market you've identified. Selling is about getting in front of the customer. What happens if one "link" is missing? Simple: no commission check. If you haven't identified the people you want to market to, how will you find them? If you don't prospect, whom will you sell to? You will be at the behest of whatever business happens to come your way based on existing customers, which could be good but may not be enough and will diminish over time. Defining your market is about finding the right prospects. This is more about quality than quantity. Prospecting and cold calling depend on numbers - it's all about quantity. The more people you get in front of, the more chances you have to sell. Selling is about finding the right problems, the ones customers are feeling. When you are in front of customers, it isn't about numbers - it's about preparation and planning, about asking the right questions. The arrow in figure 2 shows that you must get feedback from your customers. Sales professionals must seek feedback from customers in order to know what they are doing right and what they need to improve, just as companies do. 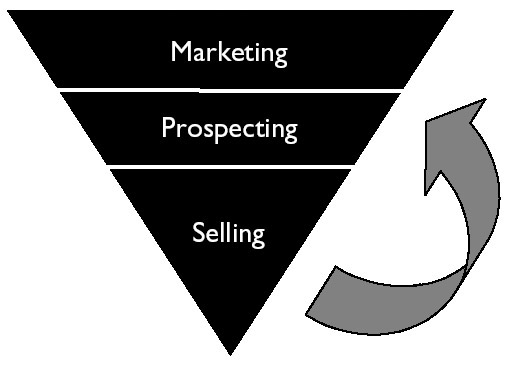 The concept behind this model is that the best salespeople are good not only at selling, but at marketing. They understand who their customers are and what they have to offer them that is unique or special. They understand how to position themselves with their market to take maximum advantage of their strategic strengths. Sales leaders blend the marketing and sales function. They place a lot of emphasis on understanding their market before they start selling to it. They are also adept at working with their marketing people to develop special features or products to meet customer needs. Top producers don't rely on high-pressure tactics. Instead, they earn the customer's business by understanding the customer, the customer's industry, and the customer's customers. They build trusting relationships with customers and help them solve problems and take advantage of opportunities. They understand which customers they serve best and how to serve them. Serving customers well requires continually improving. This might sound straightforward and easy, but it takes critical self-evaluation, commitment, self-discipline, and continuous training and learning. This resource is intended to provide information, examples, and opportunities you can apply and personalize to your business. It is designed to be practical so that you can get the information you need quickly. Developing well-considered answers to the questions the book poses and then applying them consistently will help you improve sales effectiveness, income, and profits. The first element of the model, discipline, will help you be clear about what value is in specific forms and in the customer's eyes. The second element of the model, direction, will help you be clear about who your best customers are and how you can deliver high-value solutions to them. 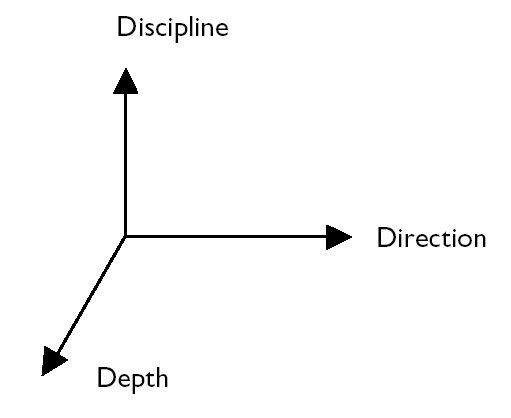 The third element of the model, depth, will allow you to become highly knowledgeable about the customer's business, comprehending it from a different perspective, and even understanding it better than the customer does in some respects. Because you're in sales, you've found things that work for you. Keep on doing them. You've probably also found some things that don't work quite as well as you would like. This resource will help you understand why the things that work well for you work the way they do and what you can do to change the things that aren't working so well. If you are going to deliver high value to your customers, the first thing you need to do is to solve their problems. Selling is about solving customer problems, whether those are problems they are currently facing or problems they will face as their marketplace evolves and their needs change. When I asked a top sales professional about what he did that allowed him to stand out in his field, he responded very simply, "I solve problems." Simple, but not easy. If you can't put your finger on your customer's problem, you won't solve it. Worse, you will waste time and lose credibility. You must describe the problem clearly, and do it from the customer's point of view. The problem should be one the customer sees value in solving. To find out what the really difficult problems are, ask the right questions and listen before acting. The most successful salespeople are the ones who find pressing customer problems and do something to solve them in a way that is convenient, cost effective, or timely. Top salespeople find problems that customers are ready to solve, then work hard to solve them. Of course, finding those problems and then delivering good solutions for them requires a well-planned and organized effort. This resource provides the steps for delivering high-value, innovative customer solutions and recommendations for identifying the customer's priorities for solving those problems. Top sales professionals know that when you find customers' significant, pressing problems, they will be willing to pay for solutions. Finding those significant problems means sorting out customers who are ready and willing to buy from those who aren't. A critical success factor is how to market your problem-solving abilities so people know what you can do for them and how they can save time, money, or effort by using your solutions. Taking the initiative to identify and solve customer-related problems in unique ways is leadership. Sales leaders open untapped and sometimes vast new market opportunities. What problems are you solving for your customers? If you were to ask your customers, what would they say? If you asked them to prioritize those problems, would there be any surprises? Customers have many problems. Find those that they want to solve the most and that you are uniquely qualified to solve, and you will have a winning combination. So, how do you solve problems? There are proven problem-solving steps you can use. You may use them already. Let's take a look at one approach. People who are really good at solving problems go about it systematically. They have a way of placing the problem in context. They don't jump to conclusions. They evaluate alternatives. A good way to become a systematic problem solver is to adopt the following five-step problem-solving process. Identify the problem. This is critical: you must try to solve the right problem. Don't try to solve a problem the customer sees as low priority or unimportant. Identify the right problem by asking the right questions and observing. You cannot identify the customer's problems by presenting your products. What's leading the customer to feel there is a problem? Is it something specific, or is it an intuitive sense that things aren't as they should be? Can the customer define the problem? Analyze the problem. How often does the problem occur? How severe is it? Are there any special circumstances that are present when it occurs? What might be the causes of the problem? Can you rule out any causes? How long has it been going on? Has it gotten worse? How is the problem affecting other processes or people? Identify decision criteria. How will you and the customer make decisions when it is time to decide? How will you weigh the criteria? Can you identify independent standards that can be used? Develop multiple solutions. Don't stop at the first solution that you or others identify. It may be good, but much better ones may exist. Evaluate alternative scenarios. As objectively as possible, assess the pros and cons of each. Choose the optimal solution. Use the criteria you developed in the third step of this problem-solving process to choose the best solution. Develop a base of support that will ensure you can implement the solution. Prepare for contingencies. When you solve problems systematically, you save time, achieve better solutions, and increase your credibility with the customer and the perceived value of what you've done. If you can solve problems the customer is facing more expeditiously than someone else, the customer will appreciate the time saved. Problem solving involves some considerations beyond those addressed by the five-step process. Once you have identified the problem you can sometimes rely on a known solution or a combination of known solutions. At other times, no ready solution is apparent. In that case, you may need to do a business case analysis to determine whether it will be profitable for your company to develop a solution. This includes asking what might be involved in developing the solution, how much time the process would require, and how well suited your company is to do the job. The issues become more complicated, but the problem-solving process may also be more rewarding. You may need to tap into the knowledge you have acquired in solving similar or even dissimilar problems or the knowledge that exists in your company. You might need to have someone initiate research and create a solution from scratch (which can be cost prohibitive), or you can find a partner that already has the solution you need. You will need an innovative approach. Deciding to create solutions and driving them through the organization is part of what makes exceptional sales leaders exceptional. Let's assume for the moment that a company wants its salespeople to improve their ability to uncover the high-priority problems the company's customers are facing and that they are not getting the information they need to do so. The reality is that there are a limited number of reasons people don't do what they are supposed to do. They don't know they should do it (caused by poor communication). The don't know how to do it (caused by a lack of skills). They don't want to do it (caused by a lack of motivation or a lack of rewards). Something keeps them from doing it (caused by a lack of resources or tools). So if the company wants to change the skills, behaviors, and performance of its salespeople, the question is, what is the reason they aren't doing what they should or could be doing? Using the reasons listed, we can start to isolate the problem or problems. If the salespeople don't know how to identify customer problems, then training would be an appropriate solution. Most times, the issue isn't as simple as not knowing how to do something. Experienced salespeople already use a variety of skills, so it may be an issue of refining or advancing those skills. It may also be a case of changing habits that have developed over time, habits that interfere with doing the right things. The salespeople may not want to do it because their managers don't approve of it when they do (a negative consequence). In this case, if they already know how to do it, the solution must involve working with the managers to gain their support or to provide them with the skills they need to understand customers' current needs. The idea is to use a systematic approach in isolating the problem. Don't rely on superficial observations. When I say that sales leaders should deliver high-value solutions to customers, what do I mean? While it might be intuitively obvious, let's not leave this distinction to chance. Value is what the customer determines it to be compared with available alternatives. It can be objective, subjective, or both. Objective measurements of value can be developed from cost savings or from revenue or profit increases. Determining exact amounts, even in these specific areas, can be difficult because relationships between revenue or profit increases and particular causes can be indistinct. And this process requires running tests, which aren't always practical. Absent exact amounts, estimates are better than no data. What about subjective measurements of value? How much does the customer value the guarantee, for example? Or an extra level of service that you deliver? Or exclusivity? How does the customer prioritize or rate these? If you can measure the value that customers derive from the products or services you sell, then you can reinforce the benefits of the particular products or services you sold them and gain insights that you can use to better sell high-value solutions to other customers. Once you make a sale, if you reinforce the value of what you sold to the customer, you get three benefits. First, you increase the chances of retaining the customer and establish credibility with the customer that will likely generate repeat sales. Second, you find other areas in which you can help the customer. Third, you will be better able to find and sell to other customers who are looking for similar value. In a Harvard Business Review article, James C. Anderson and James A. Narus advised that understanding what customers value is the most effective way to deliver the greatest possible value to customers. They suggest that an offering has two elements: its price and its value. Raising the price doesn't change the value. It changes the customer's incentive to purchase. Suppliers can demonstrate value by providing a case study to the customer after the solution has been implemented, relating the value realized to the solution proposed. Then they can draw on these case studies when making proposals to new customers. Knowing how customers value the elements of the product or service will also allow you to eliminate value "drains," as Anderson and Narus call them - services that cost you more to provide than they are worth to the customer. For example, in a restaurant, most people want their server to pay attention to them without annoying them. Achieving the right balance is key, and eliminating some degree of communication would work to the server's advantage. The customer is the best one to tell you how often and in what form he or she prefers communication. One company that provided a great deal of price information on its website for car shoppers found that people got the information, then went to a local car dealer instead of clicking through in their site to order the car. The company was losing money on the site even though it was providing value. They concluded that they needed to get something of value before they gave it, so they did something simple: they reversed the screens. They asked people for information (in a way, qualified them) prior to getting the price quote. As a result, the company is now earning money on the site. The adage that people value less that which they receive for free may have been at work. When customers had to give some information, the perceived value of what they got increased. The company may not have had as many site visitors, but those who stayed bought. Do customers perceive you as someone who is eager to sell to anyone, or as someone who provides products and services matched to their needs? Appearing too eager to make a sale makes people resistant to buying. Having some degree of exclusivity makes customers more eager to purchase. When you call for an appointment with a service professional and you can immediately get an appointment, don't you wonder why? If this person were good, wouldn't you have to wait? Buy.com was faced with a similar situation. Buy.com was selling products at prices that were unprofitable, hoping to make up for those losses with advertising sales. That business model, as many dot-coms found out, didn't work as well as it sounds. Buy.com decided it needed to raise prices, but at the same time keep customers raving about the value they received. "To remain viable, we needed to create raving-fan clients who'd stay loyal as prices climbed," said Tom Silvell, vice president of customer support. Silvell reviewed every part of the customer experience. Using customer relationship management tools, they were able to cut order time, return time, and costs. The quality of the customer experience improved. And service ratings went up dramatically. Silvell said, "We built our programs and technologies around what customers wanted and needed instead of letting our programs and technologies drive their behavior. This tactic helped transition us from a price-sensitive shop to one focused on the customer experience, on offering value to clients, and on providing quality merchandise at reasonable prices." A study conducted by the Gartner Group found that less than 10 percent of companies worldwide have successfully implemented what they call a "customer-centric" approach. A company may think it focuses on the customer, but likely still has much room for improvement. What is your perspective as a sales professional? What is the customer's buying experience when buying from you? Is it convenient and efficient? How do you know? If you don't, now would be a good time to find out. What is your business model? How well does it work? How do you find and serve customers? A business model is simply a way of describing what your business does and how it does it. An aspect of recent business models, for example, is the channel for reaching customers. Do you sell directly or through others? Do you use fixed pricing, contracts, or negotiated pricing? There has been much discussion lately about business models, prompted by the application of the Internet to new ways of reaching and selling to customers. The unfortunate downside to some Internet businesses is that their models overlooked the need to produce profits. The assumption was that investors would tolerate long-term losses almost indefinitely, as long as the promise of future profits fueled an increasing stock price. But the bubble burst when the underlying demand evaporated and investors sought companies that were producing or had demonstrated that they would produce profits in the future. Even having a compelling vision for a business model and deep-pocketed investors is no guarantee of success, as Global Crossings proved in the early 2000's. Their vision was to create a global fiber optic network, but they had trouble signing up enough customers to fund the huge investment. The importance of the business model in this case, and with so many dot-com businesses of that era, was that the model has to factor in profitable sales. Unrestrained growth leads to unrealistic sales requirements that place salespeople in untenable positions. Individual salespeople operate with sales models that may be effective or ineffective. To maximize effectiveness, they need to think about how they will reach their potential customers. For example, you might try something as simple as sales materials that describe your qualifications, experience, present customers, results you've achieved for your customers, testimonials, and contact information. Consistency is firmness of constitution or character. Customers value consistency, even at the expense of higher value. They want to be sure about what they are receiving; they don't like negative surprises. When you deliver consistent value, you increase the perceived value of your product or service. The following three leadership strategies will help you consistently deliver on the promise of value. Make decisions consistent with your goals and values. People tend to encounter difficulty when they make decisions inconsistent with their goals or values - those things that are really important to them, their company, their customers, or their loved ones. How we make important decisions can be as important as the decisions themselves. Every decision brings consequences. With important decisions, the consequences can be far-reaching. Produce results consistently. Customers come to have certain expectations. When those expectations aren't met, they are disappointed, especially if their expectations are higher of you than they are of others. The adage "Underpromise and overdeliver" is the key. Have just a little something extra in reserve so that you don't exceed expectations one time and not meet them the next time. Build in a cushion, especially when it comes to cost and schedules. Behave consistently. People judge us based on our behaviors, not our intentions. Inconsistent or unpredictable behaviors make it difficult for other people to know how to best work with us, or, more important, whether they can even trust us. It makes it difficult for people to plan. Trust is rooted in the assurance that someone will do something they say they will do. It is a driving force in relationships, especially ones involving customers. Their reputations, and sometimes their jobs, are at stake. While trust isn't easily measured, you can be sure it underlies our motives and our responses. What are the attributes of a sales relationship with high trust levels? Good communication, innovative thinking, and a lack of hidden agendas. Customers who trust salespeople provide good information, take the advice of salespeople, and give them the opportunity to keep their business. Surveys have shown that when people travel, what they value most in a hotel is consistency. Whether it is a luxury or economy brand, they want the accommodations and services to be the same every time they return. People who go to their favorite fast-food restaurant want the same level of service no matter which location they visit. The same is true for most of us with the products or services we purchase. We value consistency. So do, of course, our customers. Make sure you reinforce the value you provide to your existing customers, especially when budgets tighten up. The customer may not recognize the value that may be apparent to you. If you take it for granted that the customer understands everything that you do to deliver value and you are mistaken, the customer may make decisions that will be difficult for you to reverse once they are made. It is better to be proactive by understanding what your customers' value perceptions are and communicating with them early in the process about that value. Identify the problems and opportunities unique to your customers and then create what they consider high-value solutions.